Taking great ideas and bringing them to life is one of the things we do best - and we enjoy it. Over the years, many customers have come to us for a way to express their taste, even hoping to do so from thin air. From in-home measurements to design, we can help you work out each detail of your one-of-a-kind dining set, entertainment center, armoire, or anything else you can imagine. We design your dream furniture by combining your taste and style with our knowledge and experience. 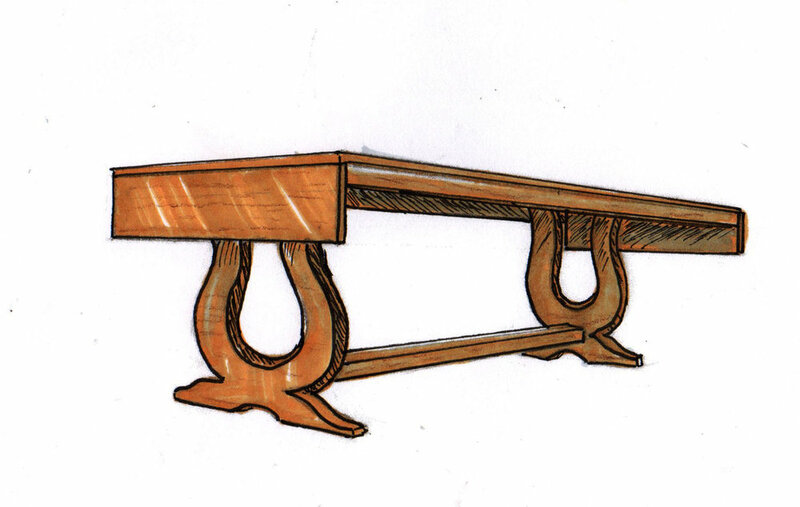 From conceptualization to completion, this intricately designed yet functional table was created for a specific space in a very eclectic and interesting home. This table was an inspiring piece thought up by a local interior designer, and built in our shop for a one of a kind home. 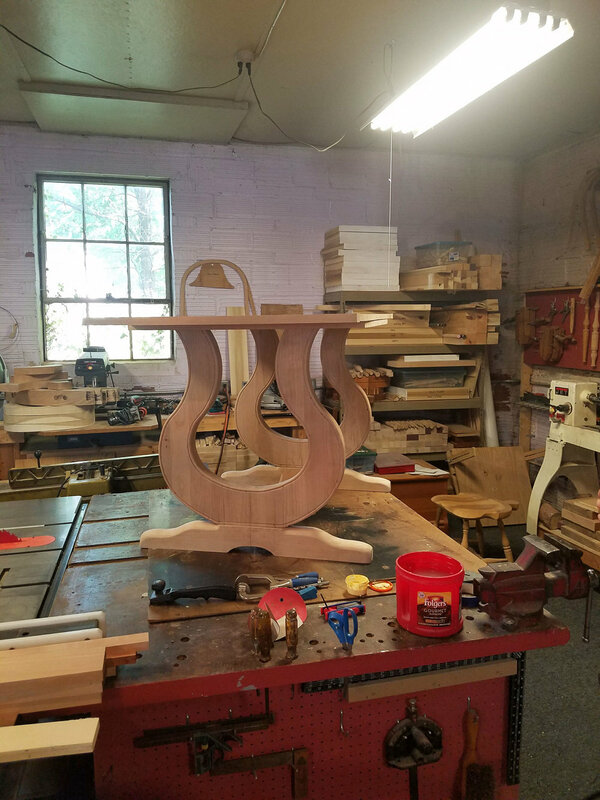 The homeowners were inspired by a table they had seen in France, and had us work with their designer to build a similar one to their specifications. 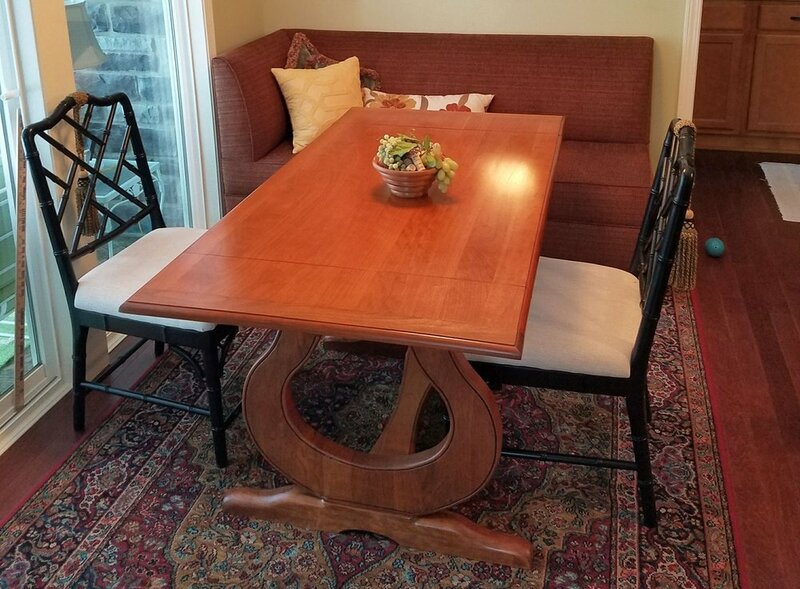 Using wood from a cherry tree they had taken down previously in their own yard, this table was customized for their home and built to accommodate the lovely pewter carving. Every single detail of the wood carving was sketched, cut, and hand-filed right in our shop. Working with a home contractor, we built and finished all of the cabinetry for this lovely kitchen. Including many unique details, such as an appliance garage, sliding silverware drawers, glass shelving, and even a pop-up mixer stand, this kitchen was functionally designed to suit the specific needs and tastes of the homeowner. Inspired by a mustard colored dry sink we had on display within our gallery, a very imaginative customer approached us with a project. Could we design a dry sink that fits perfectly in her farmhouse, for a kitchen that has not one piece of traditional cabinetry? Not only that, but could we keep the traditional aesthetic and Early American style while adding a functional sink and plumbing? Using traditional methods of construction, we designed her a dry sink that fit perfectly with her hoosier, corner cabinet, and vintage stove. Of course, it also fit the space allotted, not to mention the classic style sink the customer already owned. Living in a coastal Northern town, we get very unique requests for Lakeside decor. One of our favorites is this table top, which we custom built for a customer's nautical home. Highly polished and even accurate, this table top is sure to make a beautiful statement piece. While a corner cabinet may not seem to be the most challenging build in the world of furniture, we take the time to make sure every single detail matters. 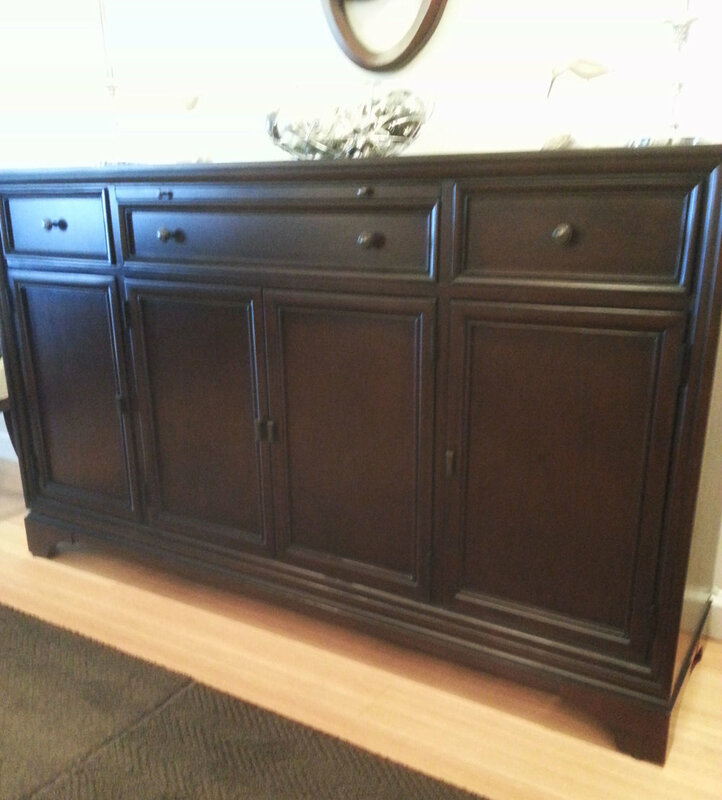 This corner cabinet was styled to reflect the existing furniture in the room, such as the molding, trim, and drawer pulls of the nearby server. 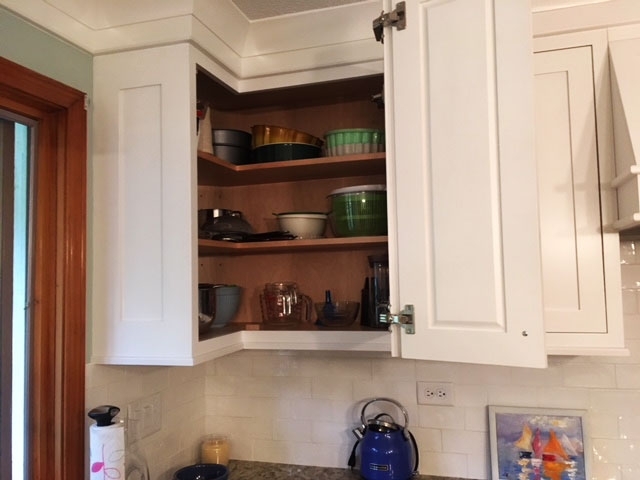 It was also molded to ensure that each horizontal line was balanced in proportion of the room; for example, the "counter" of the cabinet is the exact height of the counter leading into the nearby kitchen. Designed for a dear friend, this Windsor style chair displays the French heritage of the recipient. In the midst of political troubles in France, Garrett Aston blends his signature dove, engraved into every Windsor chair made since 9/11, with an image of the Eiffel Tower, on the underside of the chair to represent peace and unity. Living in a harbor town on Lake Erie, our clients and friends often come to us with unique and creative ways to display their love for all things nautical. This summer home bunk bed was built right in place, for some lucky young ones to dream of sailing all summer long. Just like many of our custom designs, this day bed was built upon an idea. 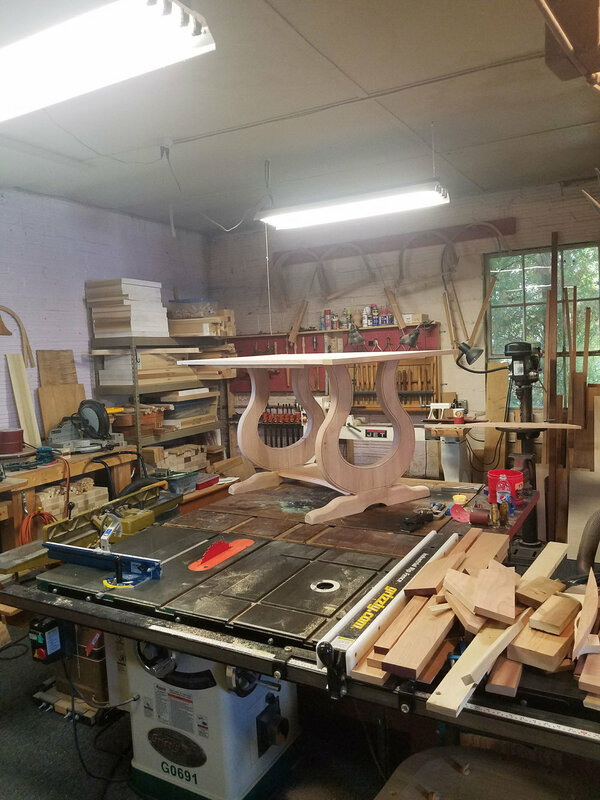 At the Chairmaker and Friends, we constantly strive to combine form and function. This daybed was created to fit into an eclectically designed sunroom near the lake. The style aesthetically captures its elegant yet whimsical surroundings, while providing a functional use of both storage and relaxation to its specific area.